I will also provide a compatibility CD that will allow the game to run under ALL VERSIONS of Windows 10, 8, 7, Vista and XP, both 32 and 64 bit. 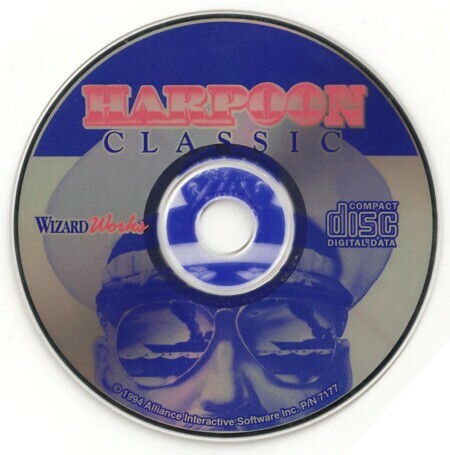 This is the first Windows-native release of Harpoon 1, which is essentially the original DOS version with a cleaner interface, all battlesets plus 48 new scenarios, and the original scenario editor. In-flight refueling and weapons reloads for ships were removed from this version. Based on Larry Bond's realistic tabletop wargame of the same name, Harpoon not only is faithful to Bond's game but adds many great features only possible on PC: comprehensive unit database, intuitive mouse-based interface, and outstanding scenarios, both historical and hypothetical. The level of detail, complexity, and nuances is staggering-- you will discover new gameplay subtleties every time you replay the game, for years to come. Not to mention learning a thing or two about classified information . The game was very realistic compared with the other naval simulations of the time it was released. There were a great number of missions shipped with the original game and many additional battlesets were released later on. A scenario editor was also available. The larger battles were really complicated and it took hours or even days of intensive playing to beat them. Radar and sonar detections worked just like in the real life, weapons were not unrealistically accurate and larger ships took numerous hits to sink. Weapon reloads and aerial refueling were also available, as well as numerous weapon layouts for the aircraft. This was also one of the very few naval simulations which included the possibility of actually using nuclear weapons. It was very rewarding when after a long battle against an American carrier battle group one of the AS-4 Kitchens fired by a flight of Tu-22M Backfires at last got through the defenses, hit the carrier and obliterated it, as well as all other ships nearby.